These Crispy Baked Tofu Nuggets have an addictive texture and flavor that the whole family will love! They’re simple to make, packed with protein, and tasty to boot. Vegan and easily gluten-free! Do chickens even have fingers?! Perhaps they do. Okay so even if chickens do have phalanges, chicken strips/tenders/fingers are really just breast meat, no? It’s all a big farse! I guess they look kind of like weird knobby fingers when you fry ’em up, hence the name. I apologize that these crispy baked tofu nuggets look absolutely nothing like fingers. But maybe that’s a good thing. I think it’s a great thing. Tofu hasn’t been a major part of my life lately. It’s not that I don’t like tofu, it’s just that my pantry is always so stocked with beans and legumes that I almost forget about it. I’m on a mission to use up all the random pantry goodies that I’ve bought and failed to use in recipes, like brown rice noodles, capers, red lentils, and artichokes. There are plenty of randoms in the refrigerator too, namely this tofu. All I wanted for dinner last week was comfort food and let me tell you, these crispy baked tofu nuggets fit the bill. They made me remember how much I actually adore tofu–when it’s cooked correctly! This recipe isn’t the icky squishy mushy tofu you may be used to. No no. It’s chewy and bread crumby in the best way possible. If there were ever a time you were gonna crave tofu, this is it. These actually reminded me of eating chicken nuggets as a child, which was kind of a delightful memory in a strange, nostalgic way. When you’re sick of beans in every way, shape, or form like I am, crispy tofu fingers are the BEST change of pace. Hello, chickeny childhood. 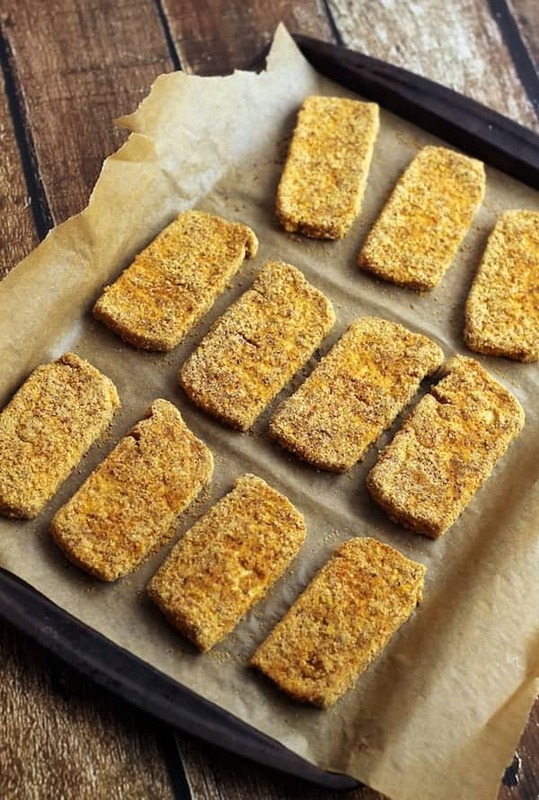 Crispy baked tofu nuggets for the win! 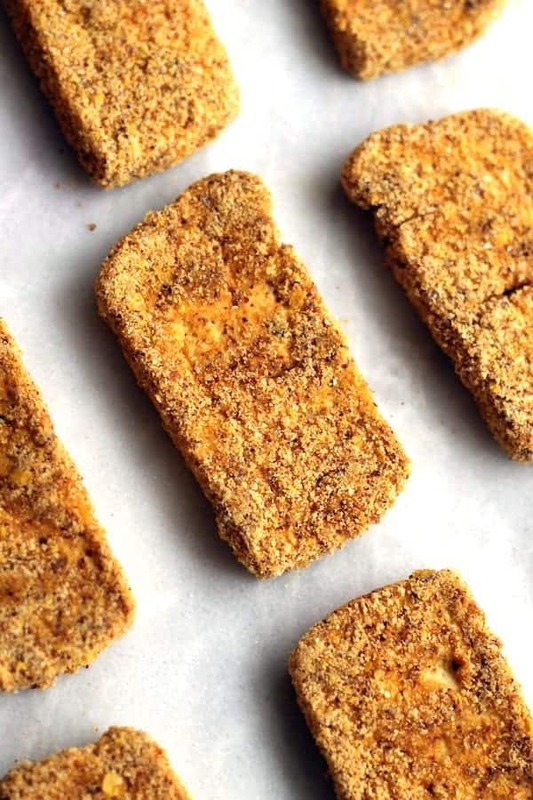 This Crispy Baked Tofu Nuggets have an addictive texture and flavor that the whole family will love! They’re simple to make, packed with protein, and tasty to boot. Vegan and easily gluten-free! Remove tofu from packaging and press using a tofu press or on a plate with a few heavy objects and a dish towel. Press for at least thirty minutes. Place almond milk in a shallow dish (I used a round glass tupperware). In another shallow dish, stir together almond meal, breadcrumbs, cornmeal, nutritional yeast, garlic powder, chili powder, smoked paprika, and salt. Cut tofu into 10-12 slices. 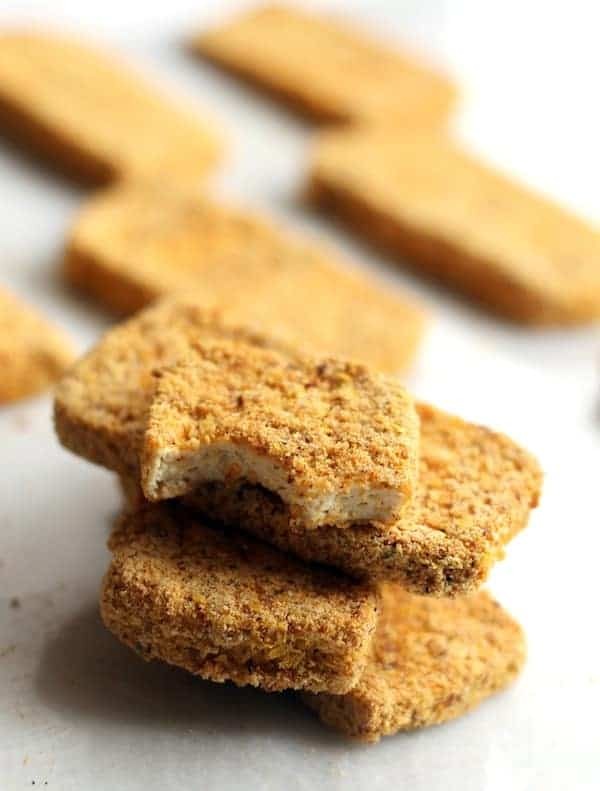 Use one hand to dip the tofu slice in almond milk, and then the other hand to dredge it in the bread crumb mixture. Cover it fully and tap off excess. Repeat with each slice of tofu and place them in an even layer on a baking sheet line with parchment paper (or sprayed with olive oil). Bake for 20 minutes and then flip and cook for another 15 minutes. Serve with ketchup, mustard, or preferred dipping sauce. Tofu is amazing when cooked correctly- some people don’t know what they are missing! I like your bread crumb mixture, pinning this to try soon! I don’t think I’ve ever looked at tofu and thought, “oh man I want that!” but THIS makes me want some tofu right now! Fantastic recipe! Hellz friggin yes to ALL the buffalo sauce!! Yum!!! I love that you added corn meal. I bet that gives these the perfect amount of crispiness! Exactlyyyy! Corn can do no wrong. Wow, these look so good! I’ve been planning more meatless meals for myself lately, trying to go vegetarian at least 5 days a week now. This would be perfect for a protein source! How long would they last in the fridge? Could you freeze them? Perfect! They’ll last a good while in the fridge…I tend to keep things longer than I should, like a week ;) I heated them in the microwave because I was lazy but I’m sure the oven or stove-top would optimize the texture. Not sure about freezing them but I don’t see why not! These look awesome lady! I love this idea to change up the normal bean affair. This made me chuckle – “on a plate with a few heavy objects and a dish towel” – so how I will be doing it! Fried capers?! Sign me up! I haven’t made tofu in AGES! I used to make my baked version all the time until I got fined from my uni library because one of the textbooks were slightly worn from pressing the tofu lol! OMG a textbook fine from pressing tofu?! That’s MY job!! Are you sure it wasn’t steak? Or kettle corn granola bars? you do tofu right girl. i’ve had a block in my fridge for WEEKS because I wasn’t really craving it, until this post. I have almond meal in the fridge which I need to use . . . this might just be the answer! I love it when tofu goes crispy! It has the best texture! Hope you love it. Running out to buy tofu as we speak! i love tofu and like you said making it correctly makes a huge difference. definitely trying this. We all liked them at one point or another! With fish sticks, maybe you could try a tiny bit of dulse to give it that ocean flavor. Might be interesting! Followed your recipe exactly and these came out perfectly ! Even the hubby loved them. Made it with a side of Angela’s roasted Buddha bowl, yum! Love these! I was starting to get so bored with eating the same old roasted tofu over and over again every week so this was a great new way to try cooking it. 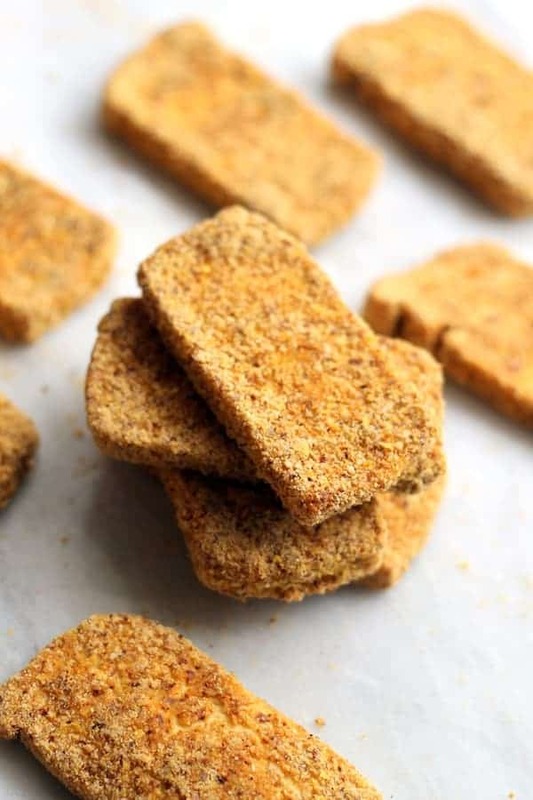 I didn’t have any cornmeal so i just added a little extra nutritional yeast and bread crumbs – they still turned out great! I bet the cornmeal adds even better crispiness though. Hmmm I’ve never tried that so I’m not sure :/ Sorry! Hope it works out! Thank you for suggesting using BOTH hands to do the breading ( one for the milk, one for the bread). I had never thought of that and it works beautifully. It’s so much faster without the numerous trips to the sink to get the globs off my fingers. One tip on getting water out of the tofu- I cut it up (into fingers) right out of the package, lay it out on a baking sheet (sprayed with olive oil or on parchment) and put it in a 350 degree oven for 20-30 minutes. It gets as much or more of the water out as me trying to balance a heavy object on top of the wiggly tofu. Then proceed with the directions. Just wanted to drop a quick thank you! My 7yo daughter said “no” to meat about 4 months ago. Needless to say, it’s been an adventure finding nutritious plant-based meals that my VERY picky girl will actually eat. We tried these last night and she LOVED them! The adult folks (seriously anti- ‘fu) were also pleasantly surprised. Thanks so much!